One Sunday, in the heart of a pleasant August, I had two out of the ordinary experiences. One of which was a rare treat, having a brunch in the East village with friends, and the other I consider a once in lifetime experience. I was one of the first to see a just completed, larger than life size sculpture of my late spiritual teacher, Sri Chinmoy. Everything about New York is big. But when I moved here more than a decade ago it was not its bigness or its boldness that attracted me to the city. It was the quiet humble beauty of my spiritual teacher that drew me here, and with whom I had already studied with for more than 20 years prior to coming. The lofty spiritual heights he demonstrated where destinations that I felt I too could also attain one day within myself. His body of work in music, art, and literature was already vast, and over my time in New York it only increased even more dramatically as he actively demonstrated what self transcendence was really all about. One didn't need to be in his physical presence to learn the intricacies of spirituality but in my case it helped greatly. Having the advantage of living in such proximity was for me a rare and special blessing. He was a constant source of inspiration in my inner life and for my outer life it was a precious opportunity for me to be able to live nearby and see him frequently. His passing in October was a shock to all who loved and respected him. For those who were his students, most have found many and diverse ways to utilize the inspiration they received from him during their time as his direct students. Asidhari, a young man from New Zealand who has been in the New York area a lot the past few years got inspired this summer to do something remarkable. Earlier this spring he took upon himself the task of doing something he had never done before. It started for him while he was working on the staging for a musical performance project in London. At the time he was staying with, and assisting Kaivalya, an experienced artist who himself was just completing a full sized sculpture of Sri Chinmoy. It was there that this, not formally trained but multi talented artist, decided to complete a life size bronze statue himself, even though he had never worked with bronze, or even the clay necessary to make a base for the project. When he returned to New York in June he looked right away for a studio space to work on the statue, and basically took the first one he found in midtown Manhattan. Of course with no practical experience, he had to do research on just how to do it and then somehow bring his vision to life. Once he felt he knew what to to do he just jumped wholeheartedly into it for two solid months. Every morning he made the short pilgrimage to his studio and then stay there until night, and this continued day after day. Keep in mind also, he said precious little to anyone about what he was doing all the while. Never once did I hear him speak about this, or ever seek any kind of recognition for taking on such a demanding task with so little experience. Other than Kaivalya's statue, only one other statue has ever been made. Asidhari was also adept at nimbly dancing around my questions about what he was working on. He would quietly come by the lunch counter where I worked and pick up something to go most mornings and be on his way into the city, and never once breathed a word about what he was up to. On the morning I got to see he statue I met with him and a few of his Kiwi friends at the local barber shop on Parsons blvd. A quick survey was made before getting on the subway, and visiting the statue was relegated to second place on the Manhattan itinerary, because a quick informal survey showed that a majority of the assembled stomachs where almost lethally hungry. Also it was deduced that an art project of this scale could only be appreciated by those not being distracted by ravenous appetites. The primary breakfast destination unfortunately was hastily changed. When the hungry mob arrived panting at its front door it was glaringly obvious that the restaurant was not only not open, it did not even serve breakfast. The ravenous appetites were then somehow relocated in an orderly fashion to the emergency back up location nearby. And, as it turns out, a more than satisfactory alternative. It is a vibrant place called the Grey Dog. One, in which the prices are reasonable and service is quick and yet as I tuck into an omelet I can't help but be more interested in my curiosity about Asidhari's statue than the quality of my eggs. On the train ride back up town to his midtown studio Asidhari talked with some reluctance with me about his previous artistic achievements. Over the years I have known him we, have talked about running which he loves and even about small construction projects, liking making the worlds largest popcorn cakes. Once upon a time he studied architecture but he seems to be one of those guys who just seems to be good at everything he puts his hand to. At the same time he is uncomfortable about singing his own praises. He tells me that the first time he painted Sri Chinmoy was in April of 2005 when he made a portrait of him along with Thomas Jefferson. At the time his teacher told him that he was happy with his own figure but not that of Jefferson. Asidhari then went back to work on the canvas and when he showed it to him again Sri Chinmoy was pleased and said that he should receive 1,000 out of 100 for his work because it not only had the correct likeness but also embodied the right consciousness. Later he would tell Asidhari that he should not receive just 1,000 marks for his work but 10,000. Asidhari was of course delighted at being able to please his teacher in this way but was uncomfortable at the ensuing attention he would receive from others. All of it complimentary, but he was someone who was clearly not comfortable with the glare of the limelight. After completing the portrait he worked on several other projects that would test his creative and artistic skills. Once he made 3 large figures for a carousel as part of Sri Chinmoy's weight lifting manifestation and perhaps his most important project was creating a statue of the Indian deity Krishna as part of Sri Chinmoy's ever escalating dumbbell lifting . He is guarded about what prompted him to go forward with sculpting a large statue of Sri Chinmoy. 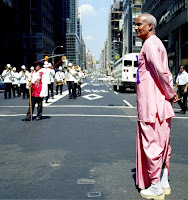 Hundreds of photographs have been taken of Sri Chinmoy over the years and many are available. It occurred to Asidhari though that in the realm of posterity nothing quite matches the significance and power of a statue. There are of course countless number of statues of spiritual figures like the Christ and Buddha around the world. Rightly so it seemed important to Asidhari that authentic statues of his own teacher should also be available. He feels statues are a powerful form of manifestation. It also should not just be accurate in likeness but also embody the essence of the teacher as well. And who better to craft a statue than one who knew and studied with the teacher themselves. He looked over hundreds of photographs of Sri Chinmoy before he began the project. Not one alone carried all the aspects he wanted to convey with his statue. In one he might find inspiration for the expression of the face. In another he would see the hands the way he wanted. He had a clear vision of what the statue should look like that seemed to already exist on another plane. The cue for how to proceed on the practical physical plane would be drawn from many photographs. Finally he got to a point when he says, "I saw clearly what I wanted to make." Starting on June 21 he saw that there were no distractions in his schedule and threw himself into the project. He rented a space and then bought all the necessary materials. It was then a matter he says of, "I had an inner vision. My job was to bring it into the physical world." He knew it would not be perfect but he would try his utmost to make it as close to his ideal as possible. He tells me of the qualities he wanted to capture in the piece, that it be majestic, and powerful, but also carry things like beauty, love and compassion and selflessness. He grudgingly tells me that at this point he has put many thousands of dollars of his own money into the project to date. As for time he thinks it has taken him close to 500 hours of work. But he has no doubts about what drove him to take on this onerous task. He says, "It's not about what I want to do. It is what I have to do." Soon we have emerged out of the train and are making our way up the broad avenues of New York. He tells me that about 2 days ago he felt he just could go no further on the statue. He feels extremely fulfilled at devoting his efforts over the past few months to the work. He tells me that each day he worked he felt like he was a channel for a higher power. He is not attached to what will happen next, but does hope to have the clay statue cast and then made into a bronze. 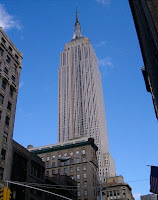 Our group soon arrives at a nondescript door on 37th st. and soon we are stampeding up several flights of stairs. The excitement of everyone is tangible, and we seem almost to race up the stairs. Asidhari puts a key in the lock and a fluorescent light sparks to life. Then there is a chorus of light gasps followed then by the almost perfect silence of awe and respect for what we see before us. Then the superlatives start to flow. Someone says, "its amazing," and another says, "its awesome." These same adjectives get repeated as the group struggles to comprehend the magnificent creation before us. I am caught up in trying to take pictures and record this moment in some way. I try and be objective but I too as I approach the statue feel as though I am actually in Sri Chinmoy's living presence. If feels to me as though I am invading his sacred space when I bring myself and my camera too close. Also because the statue is larger than life and on its pedestal, is 2 meters high, it feels as though his clay creation looms powerfully and lovingly over our small group. Someone says, that with this statue, "people will be able to remember what Guru looked like." This echoes my own thoughts. The wall behind me is covered in dozens of photographs of Sri Chinmoy. Each a unique moment, each carrying quite a different consciousness, each priceless, but also each incapable of presenting in a very physical and dynamic way what the statue does so realistically and tangibly. Eventually Asidhari tells us bits and pieces of his odyssey here in this cramped little $700 a month room, which has no windows, airconditioning, or perhaps even much breathable air over the long hot summer months. He shows us the tiny tools that scraped and molded the bits of clay. He describes the many days he worked in particular on the eyes and mouth. How one tiny adjustment could mean that he would then have to correct or reshape another feature to keep in harmony all aspects of the creation. He tells us that he was inspired to try and capture Sri Chinmoy as he was at the age of about 60 years old. That it still maintain a spark of exuberant youth and yet have a noble bearing. I hear someone say, "it looks alive," and Asidhari almost wilts under the weight of su ch lavish and constant praise. Tejaswi adds, "You can feel the Master in it." Asidhari says that each morning when he came here, that before he would work he would pray that he be an instrument. When he felt he was in the right consciousness himself he would then turn the statue, on its rotating pedestal around and start his work. As he shares his beautiful new creation with us he reluctantly admits, that right now he is as happy as he can be about his achievement. He states the obvious, "It has been an awesome experience." Later Kaivalya, who has made his own bronze statue, that will soon be publicly placed, says of Asidhari's work, "There is fantastic detail. It is an impressive effort." He says that he himself, who has spent many years working on similar projects is quite impressed that he had truly captured the consciousness of Sri Chinmoy. That no matter how accurate a statue may be in appearance if it does not convey the inner reality with its attendant divine qualities than the statue is unsuccessful. Asidhari's work he feel accurately captures this essence and offers up this reality in a beautiful and divine way. As for this statue, now made of clay, Asidhari does eventually go back to his studi o and makes a few cosmetic changes in the weeks after our visit. He has yet to work out how it will be molded little alone transformed into a bronze. For now he lives with a small but certain faith that fate will play its part in fulfilling the dream of his inspiration. He would like to see a whole series of bronzes cast from this statue but at this moment does not know what the future yet holds, for his loving offering. I ask him, when his statue is cast in bronze, just how long it should last. This notion brings a smile of delight to his face. He tells me a good bronze should last 2500 years. There is nothing more to see at the 3100 mile course these days. In a short while however, it will once again be vibrant, with visitors from around the world. They will run a few laps here, and their footsteps will follow in those of all the great champions, who so recently traveled very far here, both outwardly and inwardly. The 3100 mile runners have sacrificed so much here, and yet there is so little to show or prove that they were ever even here. But what our eyes cannot see, surely our hearts will always be able to embrace. Not just today but throughout the mists of time. It is sacred ground, because a divine dream of Sri Chinmoy became a Supreme reality here. She doesn't feel that she is very special, and yet every day Suprabha, has come to this hard and unforgiving course, of the 3100 mile race and has performed a miracle here. If you did not know her, and saw her only briefly passing by, you would probably say she can do just a few laps here, and then no more. But she has defied the limits of her human frame, and she continues to defy the physical world itself. She does not stop after one day, one week, one month, or even after running here every summer for 12 long years. If you ever wanted to put a human face, to the expression, 'never give up,' it would be that, of this 52 year old gift shopper owner, from Washington DC. What t he outside world cannot always see in her, her spiritual master saw most clearly. He knew, that if she ran, she would, with each step forward, make spiritual progress within. She was, and continues to be so fortunate, in having a very real and tangible way in order to reach her own highest. For her of course, this is not, or could ever be a solitary and self reliant journey. For in her determination, in her sweet and yet relentless pursuit of the goal, she feels that she is doing nothing at all to accomplish this. It is only in her surrender, and faith in her divine connection to Sri Chinmoy that she is able to run even one step, all day and all night, for every mile after unbelievable mile. And she of course does not do this impossible thing, ever for herself alone. It is in her utter selflessness that others, if they are also fortunate, can see that she is offering up to her teacher, every step, every pain and every glory along the way. This is why others come to her, and try to serve the divinity blossoming and glowing within her. When there is doubt or fear, or worry of any kind she offers them all up to her teacher. When there is joy, satisfaction, and ultimately victory, she offers this as well. She holds nothing for herself alone, Nothing that is, but her confidence, faith, and deep heartfelt connection with her Guru. What began as a whim, entering a 200 mile race to honor her teacher in the 1980's, has now grown into a long and distinguished lifetime of multi day running. If she had ever for a moment thought, years ago, how long and how far she would have traveled over these years she might not ever have put on shoes, or stepped up to th e starting line at all. But every year she goes on. One step at a time, one race at a time, year after year. And if we were to search for another marvel, it would of course have to be, that she is even here at all this year. At a time, when she could so easily say, "no more". With Sri Chinmoy's passing last fall, the race has lost the unbelievable divine gift of his regular and routine visits to the course. Yet she, like so many who come and run, and serve, and work here. They feel that he is still here. Though all, do so miss, his celestial smile, and grace, and the way he seemed to bring the heights of heaven to a little patch of Queens concrete. They feel, that he is still here nonetheless, and so they go on, as does Suprabha, because she knows this is what she should and must do. She is one, of unchallengeable devotion, whose faith is so clear, present, and strong, that she can feel his love and strength even stronger now. She feels this, even though the little red car no longer passes by, with the divine radiance of her teacher, behind the wheel. If you came upon this scene, and did not know her, would you, or could you ever imagine, even for a moment, that she has been here every morning, every day, for 57 days. That every day during this time, she has averaged better than 2 marathons a day, 54.6 miles to be exact. There will be another, joining Suprabha briefly on the starting line this morning. Ananda Lahari has just a few laps to go in order to finish 5000 km. This day belongs to Suprabha, and the one who inspires her to run to the highest. The Enthusiasm Awakeners start the day for her, as only they can do. Pavol, who just finished his race yesterday, has already signed on to be the morning counter. He is showing Rupantar on his camera, the marvel, which was Ananda Lahari's sprinting to the goal last night. Rupantar has seen everything with joy, done everything with selflessness, and tomorrow will not be back. Not back that is, until next year. She has no equal, and yet looks so much, like all of us mortals. What she has done and continues to do, defies belief. Yet she makes it all look so easy. We all could do it as well perhaps, if we too had her same fire within, her light and glow, her unshakable, and unflinching faith in her Guru who still lives within her heart. We seem to float along the course this morning. Her steps prancing so lig htly, her movements economical, and one pointed. She is reluctant to speak about herself, and instead, is quick to compliment others, who have shared this divine path with her all summer, that she now treads so lightly upon it now. We talk for a while about what the absence of Sri Chinmoy has meant to her this year. She feels that working on her meditation has become even more important to her now. She says, "I still work on it." As for her accomplishment here, it is crystal clear, "my running is all Guru's grace." She relates a story, of how once, Sri Chinmoy was visiting DC, and was asked about her, and her running. He said of his disciple, "On her own she would be nowhere. It is with her prayer that she can run." She laughs a little as she relates this story. She says, that he used the word prayer to the reporters, but for her, what he actually meant was, her faith in her Guru. She looks at the world of athletics and sees little in common with herself. How ironic is it then, that she, who has done more in distance running, than any woman in history, does not think of herself as athletic. How ironic as well, that the world has turned its attention to the spectacle taking place right now in Beijing, when a middle age woman is breaking world records right here in Queens. It is clear that she misses her Guru very much. She relates how once, in a previous year she felt the urgent need of his help. She does not explain why exactly, but I can easily imagine the elemental things that can come and torture your body, mind and spirit here. In the moment of her greatest need she says, the car, carrying Sri Chinmoy suddenly and miraculously appeared. In an instant all was well. She says, "He used to come to save us all the time." She adds, "he heard my cry." She tells me ab out an encouraging note that a friend had sent, in which they told her that the whole world was behind her. This struck her as a wonderful notion, but one in which she at first, did not exactly identify with. She then describes a moment, not too long afterwards, when a van, with Christian symbols on it pulled up beside her. The driver called out from his open window to her, "keep going," and started clapping his hands for her. This was followed shortly afterwards by a couple and their child who showed up one day, as if they had suddenly dropped into Queens from some remote and mysterious part of the world. Yet these same people told her they had read about her in a newspaper, and told her, "you are doing good." On another occasion she tells me of how a young girl gave her such a beautiful smile. She has slowly and methodically developed this scenario for me. She repeats the expression very carefully, "the whole world behind you." She pauses, and says now with slow and deliberate emphasis, "Guru is the whole world. He couldn't be here himself so he sent these others." She is unapologetic in her confidence in her Guru. Of her performances, this, or any of the many years she has run, her answer is always the same, "it is not me." That she is able to do this at all, she says, is proof that he is working in and through her. She looks up for a moment from her deep thoughts and gazes down the long stretch of sidewalk in front of her. She speaks so sweetly now, about the grace, that she feels inside her, and that pulls and compels her own. She says, "It is for everyone, and extends beyond this little island." Augusta, a regular on the block comes by to say hello. She has been coming regularly here since the 80's when she used to play tennis on the courts across the street. She says that the race inspires her, and "its really neat. After you go, people here go back to mothballs." Resident philosopher, Vajra says, "human beings are meant to go beyond themselves." Of the race he says, "This is just the infant pioneer of something all men will one day be able to do." Of everything that is done and accomplished here, "everything has to be placed at the feet of the Supreme." The Enthusiasm Awakeners are of course never sad. But those of us who have been blessed by their joy, their smiles, and their song, are perhaps just a little sad to see them go. Parvati and her girls cheer for everybody, and if that were not enough, they have offered up a 13 item prasad. She has a long day yet in front of her, but Suprabha goes by the Enthusiasm Awakeners, one last time. Gaurish the chiropractor, who has helped and served so much has come by to pay his respects. And, it isn't too much later in the day when Kanan's group takes over the same spot. In their own way they offer song, and at least for a moment, a shower of rose petals. She will finish her last mile, just minutes before midnight. I have asked a few, who have known her well, to comment. Sandhani says, "She has tremendous determin ation, and is extremely devoted. She consecrates her every effort to Guru. Nobody will ever accomplish the magnitude of her accomplishments." Sahishnu says, "There is no one else who could take up the challenge of this race like she can. . Her demeanor is one of lightness. She has all kinds of pain and yet is always focussed. She runs like a child." Savita says of her best friend, "She maintains throughout the race, a cheerful poise, a quiet strength, a determined confidence, and a one pointed focus. This year she has had a strikingly excellent race. I feel this is a tribute to her faith and receptivity in Guru's light, and proof of Guru's unending Grace, and undeniable divine presence." Bahula says, "It is such an honor and such a privilege to be part of her race." She crosses the finish line in 56 days 17 hours and 51 minutes. And if we want or need to put a number on Self transcendence it is her fastest time since 2003. She is 32 hours faster than her time last year. The victory song is sung, one last time this year. A young neighbor girl named Erika, has come by with her family, and wants a picture taken. She used to see her every day all summer. She is all admiration that a woman can do something so remarkable as this, amongst all the boys. She says, "this is really nice to see." All her many helpers are not in this picture. So many have gladly helped this amazing woman in her journey. She says of this help that she and all the other runners have received here, "no way we could do it without their help." There is spontaneous applause and song. And if we can no longer hear his applause, we can still, so easily feel his love for Suprabha, and for this divine child of his, the 3100 mile race. And for all those who served, who cared, and who continue to see and dream, that his supernal vision of a better world, is still being fulfilled. Not an imaginary one, but in a very real way, right here, on the streets of New York, and, in the divine hearts of humanity everywhere.